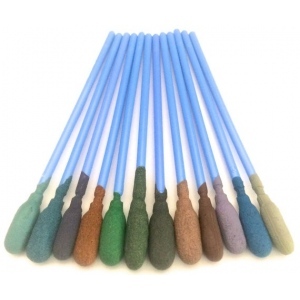 Micro-Mesh Polishing Swabs are cushioned abrasives. Backed with a flexible cloth and resilient inner layer, the micron-graded silicone carbide crystals recede to an even planing level as they establish each successively finer scratch pattern. The cushioned action minimizes deep random scratching and unnecessary steps unavoidable with conventional abrasives, resulting in extended abrasive life, the best surface finish possible, and fewer steps. Micro-Mesh is not an aggressive stock remover. Use conventional abrasives up to 240 grit sandpaper and then begin with Micro-Mesh cushioned abrasives. Download a complete Grit Conversion Chart. On paint surfaces use the swab alone without water or other lubricating fluid. For other surfaces, use water as a lubricant to extend abrasive life and cool the work surface. Keep Micro-Mesh swabs clean; contamination can cause scratches. When finished using, rinse Micro-Mesh swabs, air dry, and return them to their original packaging. Micro-Mesh is reusable! Use only 100% cotton flannel for wiping. Keep it clean, wash in warm soapy water, rinse, dry and return to the kit box. Use only light pressure when polishing or abrading surfaces. Remember the cushioned abrasive cuts with the abrasive crystal tips. The sharp cutting edges are floating on a resilient matrix. Extreme pressure pushes the tips back into the matrix rendering them ineffective and resulting in surface smearing, burning, and possible orange peel and distortion. Clean the work surface between each step, especially in cracks and crevices. Flush surface several times with deionized or distilled water to remove dust and dirt before touching it with anything. Clean abraded particles from the work piece by rinsing and then dry and inspect. Inspect the working surface between steps with a bright light to ensure you are removing the previous scratch pattern before continuing on. Using Micro-Mesh with water and a few drops of Picture CleanGel will generally result in a less effort having to be used and a slightly better finish. Only use enough water to provide lubricity to the surface, but not so much that poor contact is made with the work piece. DO NOT wear out one of the meshes by trying to make it do too much work on your first step. If your estimated damage is not readily removed, go immediately to the next coarser mesh. Removing the initial damage with the sandpaper series will take up 85% of the restoral time. The Micro-Mesh series and the buffing procedures will take as little as 15% of the time. DO NOT skip steps. Work an area slightly larger with each step to blend. Working one small area on a highly curved section could create flat spots or distortion. IMPORTANT NOTICE: Natural Pigments and Micro-Surface Finishing Products, Inc. MAKES NO WARRANTIES, EXPRESS OR IMPLIED, INCLUDING, BUT NOT LIMITED TO, ANY IMPLIED WARRANTIES OF MERCHANTABILITY OR FITNESS FOR A PARTICULAR PURPOSE. User is responsible for determining whether this product is fit for a particular purpose and suitable for user’s method of application. LIMITATION OF REMEDIES AND LIABILITY: If this product is proved to be defective, THE EXCLUSIVE REMEDY, AT OUR OPTION, SHALL BE TO REFUND THE PURCHASE PRICE OF OR TO REPAIR OR REPLACE THE DEFECTIVE PRODUCT. We shall not otherwise be liable for loss or damages, whether direct, indirect, special, incidental, or consequential, regardless of the legal theory asserted, including negligence, warranty or strict liability.